We've only just acquired a Samsung M2675FN Xpress printer and it seems to be working well. How much notice do we get that the toner cartridge needs replacing? Does the print quality fade, bit by bit, or does it simply stop printing? It seems that we need a genuine Samsung MLT D116L high capacity black toner cartridge. Should we buy one in advance, to have in readiness? Thank you. Robin Wilson. Your Samsung Xpress M2675FN printer uses the Samsung Easy Printer Manager utility which is linked to your PC / laptop to monitor the stautus of your printer and its supplies. The Samsung Xpress M2675FN mono laser multifunction printer can use a high capacity black Samsung MLT-D116L toner cartridge which lasts for approximately 3,000 pages or a standard capacity black Samsung MLT-D116S toner cartridge which will last for approximately 1,200 pages. Of course, the high capacity MLT-D116L toner cartridge will be more cost-effective if you print regularly and delivers a cheaper cost-per-page. Print quality should remain clear without fading throughout the full life of your cartridges. Replacing your Samsung M2675FN toner cartridges in good time is always advisable but we do have a next day delivery service if you ever need to order supplies urgently. Reduce printing costs with the Samsung Xpress M2675FN, this multifunction unit is the perfect choice for small offices in need of a dedicated document centre that prints, scans, copies, and faxes. It is network-ready and it can handle large quantities of print tasks, able to print as many as 12,000 pages per minute. The Samsung Xpress M2675FN laser multifunction printer even has a 600MHz processor, which means fast, and smooth printing. However, the M2675FN only prints monochrome documents and does not support automatic duplexing. 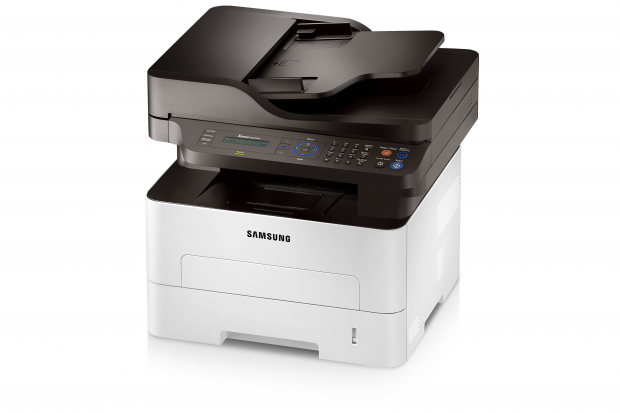 The Samsung Xpress M2675FN black and white laser printer is relatively compact, measuring only 401x362x367 mm. It has a high-speed USB port for single computer connection and an Ethernet interface for network configuration. The Samsung Xpress M2675FN multifunction printer even features a 2-line LCD display and the fax modem boasts 33.6 kbps of transmission speed. It has a 250-sheet paper cassette, and a multipurpose tray for versatile paper handling. The Samsung M2675FN Xpress mono laser multifunction printer is ideal for workgroup use, especially with its multifunction capabilities. It produces high-resolution scanned images up to 4800x4800 dpi while maximum resolution for copies and prints is up to 4800x600 dpi. The Samsung M2675FN monochrome laser printer has noise reduction features, and it can handle a wide variety of media for versatile application. The price of original Samsung Xpress M2675FN toner is cheap by todays standards and this makes the device much more affordable to run. However, the Xpress M-2675FN printer only offers monochrome operation. Print speeds are not as impressive at 26 ppm, and the Samsung 2675FN all-in-one does not support automatic duplexing. However, manual duplex printing is possible and the M2675FN MFP is designed for use with different operating systems, ideal for workgroups and offices.